Improve the uptime of CRAC units in a healthcare data center, while reducing overall energy consumption. Installation of three Danfoss VLT® Drives, reducing cooling costs by 40% as well as improving CRAC uptime. Physicians and clinicians often need access to medical data in real time — just a few minutes of downtime is unacceptable. The data center industry has created standards to define the level of uptime required for a given class of application and the infrastructure needed to maintain that level. The standard being applied to medical data centers — known as the Uptime Institute’s Tier III standard — calls for 99.982 percent uptime, which translates to no more than 1.6 hours of downtime per year. This standard requires an uninterruptible power supply (UPS) system that can handle a power outage of at least 72 hours. For the cooling system, the standard requires a level of redundancy so that the failure of any single computer room air-conditioning (CRAC) unit will go unnoticed by the end user — and that planned maintenance can occur without disrupting data center operations. That’s why a data center manager for a medical center in the upper Midwest was pleased to discover that Danfoss variable frequency drives could not only cut energy consumption by 40 percent by controlling HVAC fan speed on CRAC units, but also can improve uptime by totally replacing the CRAC units’ built-in controls. The CRAC units are positioned on the same raised floor occupied by the racks of computer servers. The units supply cool air into an underfloor plenum where it is distributed into cold aisles by perforated tiles. From there, the conditioned air is drawn into the computer rack inlets and ejected on the other side into hot aisles at a constant rate of flow. This design is simple and reliable, but maintaining a constant flow of air 24/7 does consume a lot of fan energy. So when the facility recently initiated its 20-year equipment replacement process, the manager was looking for new technologies that would address energy efficiency concerns and would ensure that Tier III uptime standards could be met. An appraisal of the existing cooling system indicated the CRAC units were in good mechanical condition; the motors generally did not need replacement. Where replacement was needed, motors, bearings and valves were readily available. The parts for CRAC unit controls, however, were becoming scarce, and the existing panels did not meet the facility’s redundancy and plant operating goals. When the data center manager contacted Brian Peterson of Schwab, Vollhaber and Lubratt, Inc., (SVL), Shoreview, Minn., near St. Paul., about automating a cooling tower using a Danfoss VLT® Drive, the manager discovered the drive also incorporated significant control capabilities that could be applied to CRAC units. In theory, the fan affinity law states that power is reduced in proportion to the cube of the fan’s RPM, which means, for example, a 20 percent speed reduction translates into exponential fan energy savings. In this case, applying the drives enabled the data center to reduce its cooling costs by 40 percent. 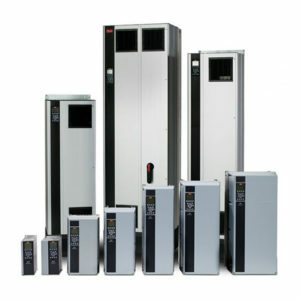 One Danfoss variable frequency drive was installed at the bottom of each of 40 CRAC units. Each unit includes a VLT® Drive, a 7.5-hp fan motor, a chilled-water coil, and valve. The intelligence on each drive regulates the fan to maintain the proper air flow rate and underfloor duct static pressure. It also modulates the chilled water valve to control either discharge air temperature or return air temperature.